One in every 3,000 babies is born with congenital diaphragmatic hernia (CDH). This developmental defect occurs during formation of the fetal diaphragm. It can be diagnosed by prenatal ultrasound, sometimes as early as the sixteenth week of pregnancy. UF Health Shands Children’s Hospital is one of the few children’s hospitals in the country that has a whole program based on caring for patients with congenital diaphragmatic hernia. From prenatal diagnosis, evaluation and counseling, through exacting and consistent care of CDH newborns from birth to discharge, to a CDH follow-up clinic, our program has a structure dedicated to providing CDH children the highest levels of outcome and follow-up available anywhere. Learn more about our CDH program. Before this surgery, nearly all infants need a breathing device to improve their oxygen levels. The surgery is done while your child is under general anesthesia (asleep and not able to feel pain). The surgeon makes a cut (incision) in the belly under the upper ribs. This allows the organs in the area to be reached. The surgeon gently pulls these organs down into place through the opening in the diaphragm and into the abdominal cavity. The surgeon repairs the hole in the diaphragm. If the hole is small, it may be repaired with stitches. In most cases, a piece of plastic patch is used to cover the hole. In a child born with a diaphragmatic hernia, the diaphragm muscle is not completely formed. So, organs from the belly (stomach, spleen, liver, and intestines) may go up into the chest cavity where the lungs are. This prevents the lungs from growing normally. The lungs stay too small for babies to breathe on their own when they are born. A diaphragmatic hernia can be life threatening. Surgery to repair it must be done in the first few days or weeks of a child's life. 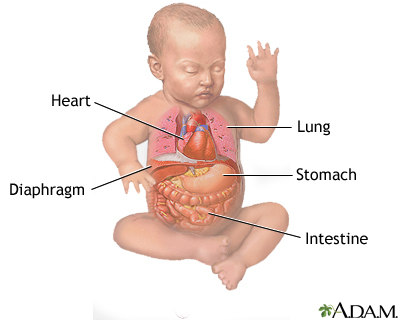 Infants with a diaphragmatic hernia are admitted to a neonatal intensive care unit (NICU). It may be days or weeks before the baby is stable enough for surgery. If your child is very sick, a heart-lung bypass machine (ECMO) may be needed to do the work of the heart and lungs. Your baby may be given medicines to control blood pressure and keep them comfortable. Your baby will be on a breathing machine after the surgery and will stay in the hospital for several weeks. Once taken off the breathing machine, your baby may still need oxygen and some medicine for a while. Most infants with diaphragmatic hernias have reflux when they eat. This means the food or acid in their stomach moves up into their esophagus, the tube that leads from the throat to the stomach. This can be uncomfortable for your baby. It also leads to frequent spitting up, vomiting, and pneumonia, which makes feedings more difficult once your baby is taking food by mouth. The nurses and feeding specialists will teach you ways to hold and feed your baby to prevent reflux. Some babies need to be on a feeding tube for a long time to get enough food to grow. The outcome of this surgery depends on how well your baby's lungs have developed. Some babies have other medical problems, especially with the heart, brain, muscles, and joints, which may affect how well the baby does. Often, the outlook is good for infants who have well-developed lung tissue and no other problems. Most babies who are born with a diaphragmatic hernia are very ill and will stay in the hospital for a long time. With advances in medicine, the outlook for these infants is improving. All babies who have had diaphragmatic hernia repairs will need to be watched closely to make sure the hole in their diaphragm does not open up again as they grow. Parker TA, Kinsella JP. Respiratory failure in the term newborn. In: Gleason CA, Devaskar SU, eds. Avery's Diseases of the Newborn. 9th ed. Philadelphia, PA: Elsevier Saunders; 2012:chap 47. Kimberly G. Lee, MD, MSc, IBCLC, Associate Professor of Pediatrics, Division of Neonatology, Medical University of South Carolina, Charleston, SC. Review provided by VeriMed Healthcare Network. Also reviewed by David Zieve, MD, MHA, Medical Director, Brenda Conaway, Editorial Director, and the A.D.A.M. Editorial team.